It is not typical for Serbian homes to have clothing dryers, although, it is possible to purchase them here. In the summer, it's commonplace to see clothing draped over balconies and make shift clothes lines strung wherever the sun appears. Chris' company mentioned that they would purchase a dryer for us, but I never followed up on the offer. I figured that Serbia was my home now, and I wanted to immerse myself in the language and the people and the culture. One cultural difference is that dryers are seen as excessive, expensive, and unnecessary. Learning to successfully do laundry without a dryer was an early, Serbian housewife, victory for me. We arrived in late July, in the midst of summer, and the radiant sunshine dried everything it kissed. Even on our sun terrace, laundry dried within a few hours of hanging. While I will never love the sandpaper sensation of air-dried towels, I quickly got used to not having fluffy, straight-out-of-the-dryer ones waiting for my grand (shower) exit. We managed without a dryer. Then winter hit. . . .
Our fabulous sun terrace used to see loads (no pun intended) of action in the summer, but without a heater, it has become an extension of the outdoors. Simply take away the windows and call this a balcony. It is cold and not conducive to clothes drying in the winter months. I brought some sheets and towels out on the terrace to dry, and two days later, everything was still wet. Needless to say, damp and musty is a disgusting combination that deserves another quick spin in the washing machine. Well dear terrace, goodbye until next summer. So, I am trying to immerse myself in the Serbian culture; but how in the world do the Serbians dry their clothing in the winter? I tried to get creative with what I had. . . I pulled my drying rack into the living room and cranked up the heat. Even in a heated room, my sheets wouldn't evenly dry because they were folded, wrinkled, and pinned in an effort to keep them on the rack. Please help!! 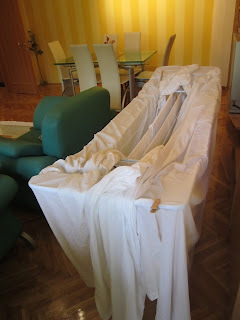 How in the world do you dry your clothes in the Serbian winter? Do you drape them over your living room furniture? Do you have clothing lines inside your home? Do you prop a fan in front of your clothes? How often do you even wash your sheets? This all seems like a lot of trouble for one load of laundry! I had lunch with a new friend last week, and I explained my laundry woes. Frightfully close to breaking down and buying a dryer, she helped me see an alternative to the "easy-way-out." "Well, Lana, they drape everything over their heaters! Yeah, whenever I walk into my families homes, I see socks, towels and undies covering every inch of every heater in the house." Forever concerned with safety, my first question was, "But isn't that a huge fire hazard?!" "No, it's only hot water that is flowing through those heaters. Some sort of energy is produced and you end up with heat. There is no fire hazard, and everyone dries that way." Chris had already explained the mystery of the Serbian heaters to me, but I was not completely convinced that suffocating heaters with clothing was a safe option. I went home and immediately tested out my new clothing "dryers." Chris' socks dried in an hour, and I am convinced that even an industrial dryer couldn't produce such quick results. I am back to being content without a typical clothing dryer. The last picture is what our stan looks like in the winter. Glad someone was able to help you. You have made some really good friends. :) Love reading your posts. Do the laundry at night (cheaper electric). When done, hang the stuff over a drying rack and leave it in the bathroom (most people keep laundry machines there as well) - bathrooms are usually smaller than other rooms, (e.g. living room) so it takes less time and energy to warm them up, especially if they're closed (door and windows). Go to bed. Sleep 8 hours. Tomorrow morning its dry. Do some ironing later if you wish. Thank you so much for all of the information! I really appreciate it! My laundry now has a new life! Or ,you can just get dryuing rack very close to the radiator, and flip it few times to evenly dry. Yes, we are totaly Eco country!